The Premier Tchoukball League in Singapore, this year's edition will see 20 teams in both the Mens and Womens Open categories competing to clinch the honour of being the Top Men and Top Women teams. With attractive prizes and high-level Tchoukball games for the first time on both indoor and outdoor courts, the STL 2010/2011 is not to be missed! Gather your friends and form teams to register now! Spaces are limited so wait no further. Download the STL Registration Form HERE! Registration closes on 5 December 2010. Note that registration is considered complete only upon payment. Please contact stl@tchoukball.org.sg for any enquiries. TBAS will be resuming the above training rogramme on every Thursday night (Women/Girls) and Saturday morning (Men/Boys) in the month of Sept 2010. This training programme is open to any players interested to improve their skills. Please email contactus@tchoukball.org.sg for more information. We wish to thank everyone that was involved in APTC 2010, whether as a player, official, volunteer or supporter. Without you, this event would not have been a great success! Here are the results of the various categories. For more details on the results and standing, please click HERE. For more details on our national players in the various categories, please click the “National Team” links above. We will be hosting the fourth edition of this competition from 9 -11 July. It will be the biggest scale ever with 450 delegates from 10 countries taking part in 6 categories. Please click the APTC 2010 logo on the left for more details. We wish to congratulate Mr Mohammad Moiz Bin Malik for winning the above award in the individual category for his contribution in Tchoukball. He is instrumental in helping the sport to grow at the grass root level as well as spending time overseas to introduce the sport to the hearing impaired youths in Chiang Mai, Thailand. 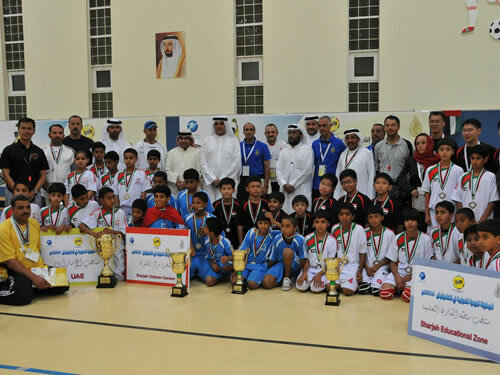 To prepare for the coming APTC 2010, a selected team of U12 boys went to UAE from 1-4 Apr for a training tour with matches against the local clubs as well as an official FITB U12 friendly match against the UAE team. Although our boys lost the official friendly match 37-44, it was a very good experience for them. More details of the team can be seen HERE.